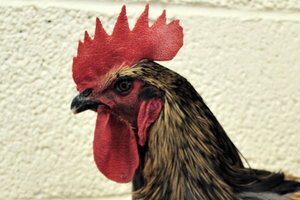 The first thing you have to ask yourself is whether or not you actually need a cockerel with your hens? 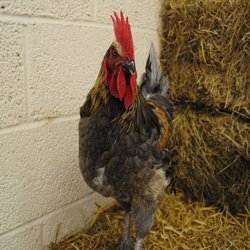 Cockerels are notoriously noisy so when keeping chickens in your garden it would be wise to consider whether or not your neighbours would object to being woken up at 4.30am regardless of what day of the week it is!! They will crow any time of day even well into the evening! 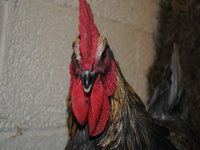 Secondly you would have to consider why you actually want to have a cockerel. You don't need a cockerel to ensure that your hens will lay. Providing that they are well cared for, have access to clean water, grit and are not overweight they should lay without any problems. If your hens are free-ranging over a large area a good cockerel will keep the flock together prevent them from straying too far from home. 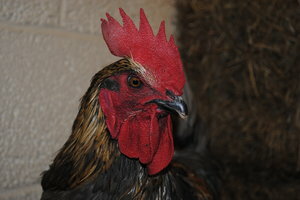 They might also protect the flock by warning them of approaching danger and tackling small predators long enough to give the hens time to get to safety, sometimes sacrificing themselves in the process. So after this you decide whether a cockerel is for you just pop or give us a call and we can help source a cockerel for you.